Hundreds of thousands of people are living and sleeping on the ground in Port-Au-Prince. Many have no homes, their homes destroyed by the earthquake. I am sleeping on the ground as well - surrounded by nurses, doctors and humanitarian workers who sleep on the ground every night. The buildings that are not on the ground have big cracks in them and fallen sections so no one should be sleeping inside. There are sheet cities everywhere. Not tent cities. Sheet cities. Old people and babies and everyone else under sheets held up by ropes hooked onto branches pounded into the ground. season approaching, one of the emergency needs of Haitians is to get tents. I have seen hundreds of little red topped Coleman pup tents among the sheet shelters. There are tents in every space, from soccer fields and parks to actually in the streets. There is a field with dozens of majestic beige tents from Qatar marked Islamic Relief. But real tents are outnumbered by sheet shelters by a ratio of 100 to 1. Rescues continue but the real emergency remains food, water, health care and shelter for millions. Though helicopters thunder through the skies, actual relief of food and water and shelter remains minimal to non-existent in most neighborhoods. Haitians are helping Haitians. Young men have organized into teams to guard communities of homeless families. Women care for their own children as well as others now orphaned. Tens of thousands are missing and presumed dead. The scenes of destruction boggle the mind. The scenes of homeless families, overwhelmingly little children, crush the heart. But hope remains. Haitians say and pray that God must have a plan. Maybe Haiti will be rebuilt in a way that allows all Haitians to participate and have a chance at a dignified life with a home, a school, and a job. 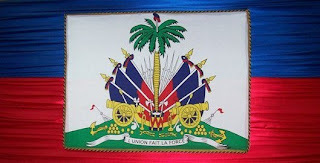 The recent earthquake in Haiti has brought the island nation a level of attention, interest, generosity and solidarity that is perhaps unmatched since it declared independence and the end of slavery in 1804 after a devastating revolution against its colonisers. We thank all the true friends of Haiti, in particular the Government and the people of South Africa for their solidarity with the victims of Haiti. The concrete action undertaken by Rescue South Africa and Gift of the Givers is a clear expression of ubuntu. Ubuntu ngumuntu ngabantu. As we all know, many people remain buried under tons of rubble and debris waiting to be rescued. When we think of their suffering, we feel deeply and profoundly that we should be there, in Haiti, with them, trying our best to prevent death. To symbolize this readiness we have decided to meet not just anywhere, but here, in the shadow of the Oliver Tambo International Airport. As far as we are concerned, we are ready to leave today, tomorrow, at any time to join the people of Haiti, to share in their suffering, help rebuild the country, moving from misery to poverty with dignity. Friends from around the world have confirmed their willingness to organize an airplane carrying medical supplies, emergency needs and ourselves. Nine days after the devastating earthquake that struck Haiti on 12 January 2010, it's now clear that the initial phase of the U.S.-led relief operation has conformed to the three fundamental tendencies that have shaped the more general course of the island's recent history. It has adopted military priorities and strategies. It has sidelined Haiti's own leaders and government, and ignored the needs of the majority of its people. And it has proceeded in ways that reinforce the already harrowing gap between rich and poor. All three tendencies aren't just connected, they are mutually reinforcing. These same tendencies will continue to govern the imminent reconstruction effort as well, unless determined political action is taken to counteract them. I am overwhelmed, frustrated and even angered by what some journalists have written about Haiti since the 12 January earthquake and I cannot believe some of the images I have seen on news channels such as CNN and MSNBC. One. Allow all Haitians in the US to work. The number one source of money for poor people in Haiti is the money sent from family and workers in the US back home. Haitians will continue to help themselves if given a chance. Haitians in the US will continue to help when the world community moves on to other problems.Two. Do not allow US military in Haiti to point their guns at Haitians. Hungry Haitians are not the enemy. Decisions have already been made which will militarize the humanitarian relief - but do not allow the victims to be cast as criminals. Do not demonize the people. "I have been told that much US media coverage paints Haiti as a tinderbox ready to explode. I'm told that lead stories in major media are of looting, violence and chaos. There could be nothing further from the truth. "I have traveled the entire city daily since my arrival. The extent of damages is absolutely staggering. At every step, at every bend is one horrific tragedy after another; homes, businesses, schools and churches leveled to nothing. Inside every mountain of rubble there are people, most dead at this point. The smell is overwhelming. On every street are people -- survivors -- who have lost everything they have: homes, parents, children, friends. "NOT ONCE have we witnessed a single act of aggression or violence. To the contrary, we have witnessed neighbors helping neighbors and friends helping friends and strangers. We've seen neighbors digging in rubble with their bare hands to find survivors. We've seen traditional healers treating the injured; we've seen dignified ceremonies for mass burials and residents patiently waiting under boiling sun with nothing but their few remaining belongings. A crippled city of two million awaits help, medicine, food and water. Most haven't received any. "Haiti can be proud of its survivors. Their dignity and decency in the face of this tragedy is itself staggering." At a Jan. 5 rally that gathered over 100 demonstrators outside the Varick Street Immigrant Detention Center, eight clergy and community leaders were arrested after stopping traffic for 30 minutes. The protesters were demanding the immediate release of Jean Montrevil, a Haitian immigrant rights leader, arrested days earlier and blocking immigration vans that were transporting new immigrant detainees to the center. Montrevil, the 40-year-old father of four U.S.-born children, legally immigrated from Haiti to the U.S. in1986 and has since resided there as a legal permanent resident. However, the U.S. Department of Homeland Security (DHS) is trying to deport him for a 1989 drug conviction, for which Montrevil served 11 of a 27 year sentence. He was freed early for good behavior, and his record has been clean ever since. 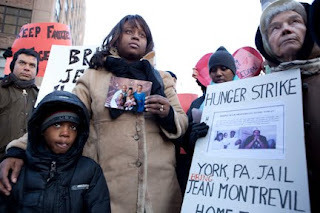 Montrevil was detained on Dec. 30 during a routine check-in with DHS in Manhattan and is now held in Pennsylvania's York County Jail, where he is on a hunger strike along with other detainees. "I am fasting side-by-side with nearly 60 others to take a stand against this horrific deportation and detention system that is tearing families apart," he said. Montrevil's wife, Janay, 31, an African-American school teacher from Brooklyn, attended the Jan. 5 rally in Manhattan. "Our son keeps calling Jean's cell phone, hoping daddy will pick up," she said. "He asks me 'Why are they pretending daddy is bad? So he will go back to Haiti?'" Janay Montrevil says the family will be traumatized if her husband is deported, particularly their 6-year-old son Jahsiah, who is severely asthmatic and disabled. "Jean made mistakes before we started building a family together," she said. "Homeland Security wants to turn me into a single mother." As a community leader, Montrevil became a national spokesperson for the Child Citizen Protection Act (H.R. 182), a proposal before the U.S. House of Representatives that would be incorporated into the deportation process if it becomes law. The proposal would allow immigration judges to consider American children's best interests before deporting a parent. This proposal is also part of Representative Luis Gutierrez's recently introduced bill, the Comprehensive Immigration Reform for America's Security and Prosperity Act (H.R. 4321). Moreover, calls from church, political and community leaders for Montrevil's immediate release and for comprehensive immigration reform have mounted since his detention. "I am being arrested because it is a moral outrage that our government would do this to such a great man and father," said the Rev. Donna Schaper of Judson Memorial Church, where Montrevil's family worships, as she was being handcuffed at the rally. "These immigration laws that destroy families contradict the values we should uphold as a society. They need to change now." Politicians are also being motivated by Montrevil's arrest. "Jean Montrevil's case is precisely why we need to see the provisions of the Child Citizen Protection Act passed into law - ideally as part of comprehensive immigration reform," said Congressman Jos? E. Serrano (D-NY). "We cannot continue to allow inflexible deportation guidelines to separate families with U.S. citizen children. I commend all those fighting on Jean's behalf, and look forward to a successful resolution of this sad case, and a day when there is more humaneness in our nation's immigration laws." NY City Council member Rosie Mendez and NY State Senator Thomas K. Duane also expressed their support. Congresswoman Nydia Velazquez (D-NY) wrote a letter to Immigration and Customs Enforcement (ICE) stating that "my office believes that [Montrevil's] deportation will be a disproportionate punishment to him, his family, and his community." Also among those arrested at the rally was Catholic leader, Juan Carlos Ruiz de Dios. "To fan the winds of change, we are putting our bodies on the line - where our mouths, brains and energies have been for many years," he said in a statement. "Our demand is simple and reasonable. We ask [DHS Chief Janet] Napolitano, as she works with [NY Senator Chuck] Schumer, to include the very principle of judicial discretion and due process in the spirit of how they approach immigration reform." Grammy-award-winning recording artist Dan Zanes joined the Jan. 5 rally and performed songs dedicated to the movement to keep immigrant families together. Meanwhile in Naranja, FL, located south of Miami near Homestead, an area heavily populated by immigrants from Mexico, Central America and Haiti, five people have been fasting in a church since Jan. 1. "Five of us are fasting indefinitely, as long as it takes," said long-time North American solidarity activist and unionist Jonathon Fried, the executive director of WeCount!, a grassroots membership organization with centers in Homestead and Cutler Bay, Florida, that fights for immigrant, worker and youth rights. 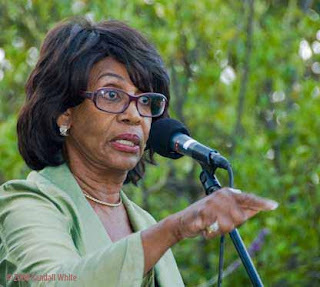 "Our target is President Obama and our goal is to get him to use the legal authority he has, now, without Congress, to suspend the detention and deportation of immigrants with American families, those who have US citizen children and/or spouses.... This decision to fast was not taken lightly. I was tired of getting phone calls from a mother, a father, a brother, a sister saying that their loved ones, their family, was taken away by ICE.... For a number of years the noose has been tightening around the neck of immigrant communities. Yet never have things been worse than under the Obama Administration. He is escalating and systematizing the policies of attrition followed under the previous administration, trying to make life so miserable for immigrants that they leave. Increasing local law enforcement's role in the deportation system; ... persons are deported for the crime of being poor, brown and undocumented, all under the false guise of combating crime; increasing the rate of detentions and deportations of immigrants, using a vast system of government and private prisons, and even secret sub-offices; violent early morning raids on homes; worst of all, is the separating parents from their children.... It is time to say to President Obama: This is on your watch." The others on the Florida hunger strike are Guatemalan immigrants Francisco Agustin and Sebastian Cano; Jenny Aguilar, a Honduran immigrant who has lived in the US for 18 years; Wilfredo Mendoza, a U.S. citizen from Puerto Rico, and a welder by profession. One anonymous woman faster, the mother of two US citizen children, ages 4 and 6, has lived in the US since 2001. She was stopped by police when driving alone in her car and arrested for driving without a license. Although she had no criminal record and the charges were dropped, she was turned over to ICE and deported, after five weeks in detention, to Mexico. On Thursday, Jan. 14 at 12:30 p.m., the Families for Freedom will hold a demonstration outside the ICE Detention Center at 201 Varick Street in Manhattan. For more information, call 646.290.5551 or visit www.familiesforfreedom.org.